The dielectric constant of a material characterizes the extent to which it insulates against the flow of charge or against the effects of an electric field. Materials with a high dielectric constant screen the effects of charges within the material, while materials with a low dielectric constant allow the effects of a charge to be felt more strongly. In solutions containing ions, the dielectric constant of the solution will determine the extent to which the other molecules in the solution feel the effects of the charges present. The lowest possible dielectric constant exists in a vacuum in which there is no material present to screen the charge of a field. 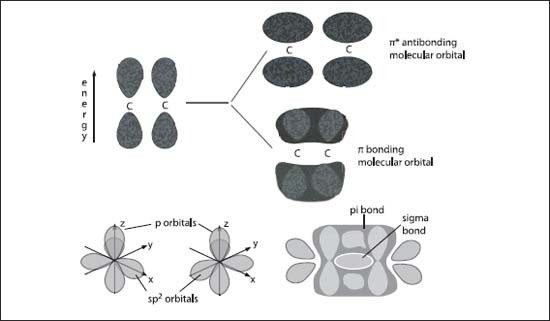 The top graphic (A) illustrates the pi-orbital formation from two p-orbitals; the bottom graphic (B) illustrates the formation of sigma- and pi-molecular orbitals from two sp2 hybridized carbon atoms.